If you’re thinking about training Muay Thai, then you’ll probably want to know what the benefits are. It can also boost your mental health, by growing your confidence and widening your social circle. I’ve been training Muay Thai for years, and it’s had a hugely positive impact on my life. 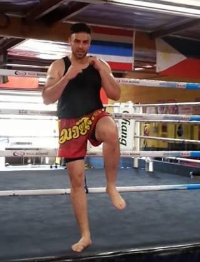 In this post, I will take a look at the aspects of Muay Thai that make it such a great sport for your body and mind, and why it’s perfect for people looking to get fitter or loose weight. Why is Muay Thai so good for cardio? Why is Muay Thai so good for weight loss? Cardiovascular exercise (or cardio for short) is any form of exercise which raises your heart rate, makes you out of breath and gets you sweaty. Doing cardio exercise is vital to maintaining a healthy heart, and the NHS recommends that you do at least 150 minutes of cardio per week. Ask anyone who has trained Muay Thai, and they will tell you that the training is extremely physically demanding. Even at beginner level, every session will have your heart racing and leave you drenched in sweat. Most sessions will last at least an hour, and you will be engaged in vigorous activity from start to finish. I’ve personally never done a sport which gives you a better workout than Muay Thai. I will walk you through an average training to session to give you an idea of what to expect. Every good Thai boxing session should start with a warm up to get the heart rate up and prepare the muscles. This is a snippet of a typical Muay Thai warm up, but there are thousands of variations out there. Warm ups will start at a fairly low intensity, but this will increase gradually. Most Muay Thai gym warm ups are similar to a HIIT workout and will last anywhere between 15-30 minutes. Muay Thai warm ups alone are enough to raise your heart rate and make you sweat… but that’s only the beginning of the session! At beginner/intermediate level; once you’ve warmed up, your coach will give you a short break before starting pad work. During pad work, you will pair up with another person at the gym and take turns in holding and hitting the pads. When it’s your turn to hit the pads, you will don a pair of boxing gloves and your partner will set them up for you to strike them with punches, kicks, knees and elbows. This requires a lot of energy and your partner and coaches will be encouraging you to keep a steady pace, so it’s another great cardio blaster. Even seasoned fighters get out-of-breath and tired from a good pad work session. When doing pad work, your coach may also put you through some pad drills to really push you. These drills really put you through your paces and will leave you exhausted. Once you progress in your training and start joining intermediate/advanced sessions, you will begin sparring with others in the gym. Sparring is a controlled fight simulation where you trade punches, kicks and knees with sparring partners. Sparring involves a lot of quick movement from your whole body when attacking and defending so it really gets the heart racing. If you’ve ever seen a Muay Thai fighter at the end of a fight, you can tell they’ve had a good workout! One of the best things about training Muay Thai, is that you train in a group and you are surrounded by like-minded people. Your coach and training partners will always encourage you to push yourself physically, and the buzz of the environment really motivates you to give it 100% – You just don’t get that kind of inspiration from working out at a normal gym, or going jogging. Why is Muay Thai so good for fat loss? As you’ve gathered from the above sections of this post, Muay Thai training sessions are tough, long, and require a lot of energy. In every session you are running, jumping, kicking, punching throwing your body around and engaging every muscle you have… It’s exhausting work. For this reason, Muay Thai burns a hell of a lot of calories. Some studies suggest that training Thai boxing can burn as many as 800 calories per hour. That’s double the amount of calories you’d burn from jogging for the same amount of time. And Muay Thai is a million times more fun and engaging than jogging, so your much more likely to stick with it and attend regularly. I only train Muay Thai (2 or 3 times a week… with the odd break) and whilst I’m not a swimwear model, I like to think it keeps me in pretty good shape…. And it’s fun! Obviously, you have to combine the training with a healthy high protein, low-calorie diet if you want to see weight loss results. In addition to keeping your heart healthy and burning fat, Muay Thai is also great for keeping you strong and maintaining a good muscle mass. Training is packed with strength building exercise like squats, press ups and sit ups, in addition to the constant throwing of punches and kicks. Your muscles are under constant tension which over time will help you build muscle. You won’t get a big bulky body-builder type physique from it, but a good lean fighting figure. In addition to the physical benefits of training Muay Thai, it also has a host of mental health benefits in my opinion. First of all, it’s fun. You learn something new in every session and you train in an exciting atmosphere with some great people – I personally get a huge buzz form training Muay Thai every time. Hitting the pads is also a great stress buster after a tough day at work. It’s also great for your confidence. Learning a martial art, learning how to defend yourself and training amongst good coaches and partners gives you confidence that you can carry into every aspect of your life. At first you feel as though you are throwing yourself in the deep end, but I believe that pushing yourself out of your comfort zone like that is the only way to better yourself. And it’s great for your social circle and skills. Walking into a Muay Thai gym for the first time can be a bit daunting. The people can seem a bit scary and you may wonder what you’ve let yourself in for. I remember my first lesson – I was terrified. But once you start training and pairing with other people, you will quickly learn that most people are extremely friendly and are more than happy to share their knowledge with you, and keen to see you improve. I’ve made lots of friends from training at various gyms over the years, and I feel a lot more at ease in social situations than I used to. So, is Muay Thai good for cardio and weight loss? Muay Thai is the most physically demanding sport I’ve ever done, and it’s also extremely exciting and challenging. If you’re thinking about taking up a new sport to get fitter or lose a bit of weight, I would highly recommend giving Muay Thai a go. Lot’s of gyms offer a free trial session to give you a taste of the training without any financial commitment, so search for some good gyms in your area. Although Muay Thai will push you physically, a good gym will always be mindful of beginners and will cut you some slack if they can see that you’re tiring – you won’t be made to do anything you don’t want to.